I decided to combine Journal52 prompts 32 and 33. One was gratitude and one was Favorite Food, and I’m truly grateful that food is plentiful in my house, when so many struggle for their daily nourishment. The two ideas just seemed to go together. 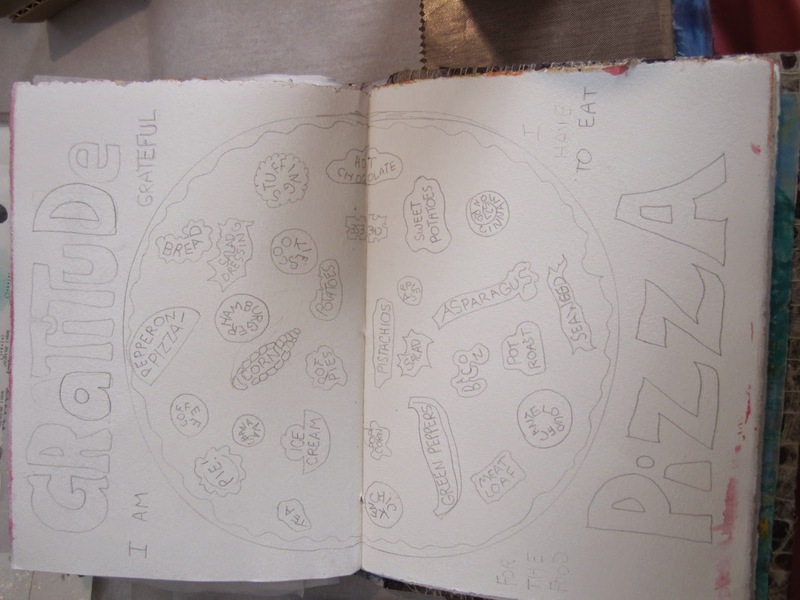 I ended up with a Gratitude Pizza. As usual, for those interested, my process is written up below! 1. 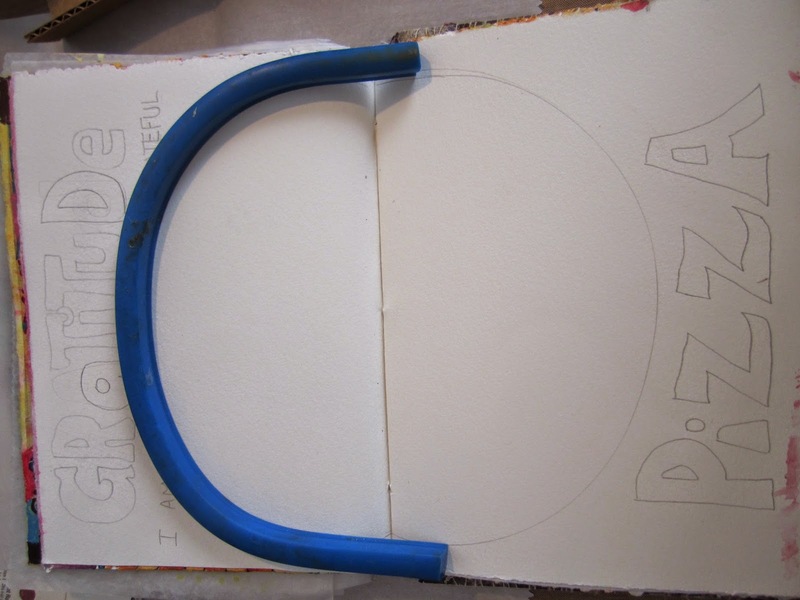 I used a flat spline, a flexible rubber strip that you can bend into shapes and use as a guide for your pen or pencil (aka as a flexible curve or flexible drawing guide), to pencil in the circle for my pizza. 2. Then I penciled in all the wording. 3. 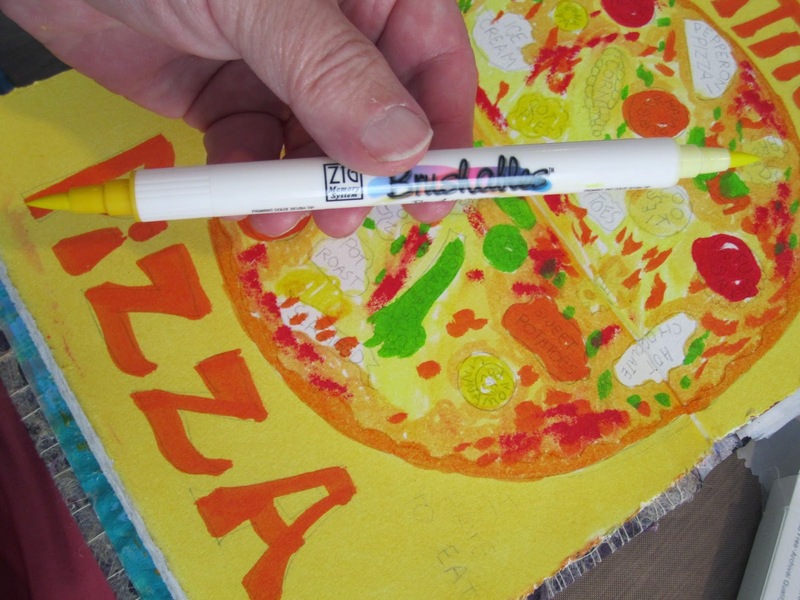 I used a Shock Yellow Montana Acrylic paint marker to color the area around the pizza. The color in these markers is transparent so the penciled letters still showed through. I’ve discussed Montana Markers before–how the 15mm tip allows you to cover large areas quickly, but I don’t think I’ve mentioned that the colors are bright, but matte. That means there is no shine or glimmer to them. 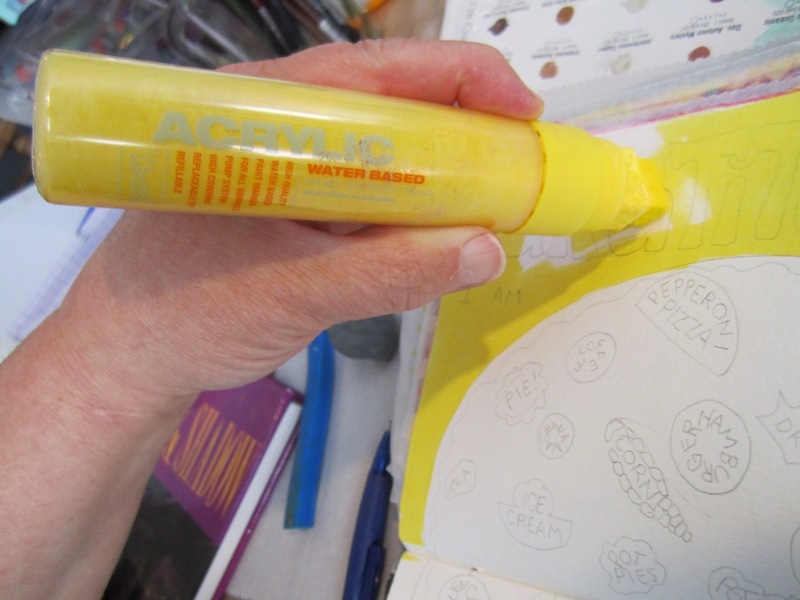 Acrylic paint is essentially gel medium with color pigment added, which means that usually they are sticky, and often pages will stick together even after the paint dries. But this varies considerably depending on what is added and how the paint is formulated. The acrylic paint that comes with a Montana Marker is very fluid, flows easily, dries almost immediately, and is NOT sticky at all. 4. 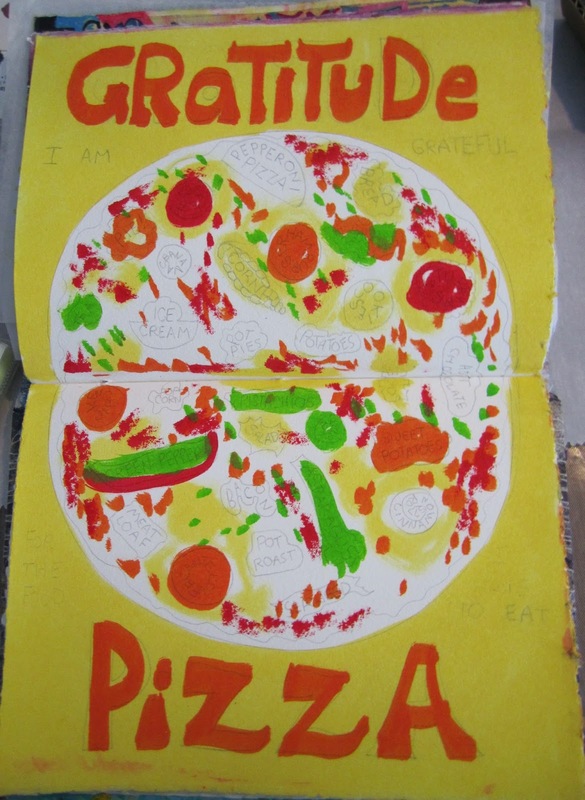 I used a Shock Orange Montana Markers for the words outside the pizza, and then colored food items on the pizza using the same two color as well as Shock Lt Green and Shock Kent Blood Red. 5. 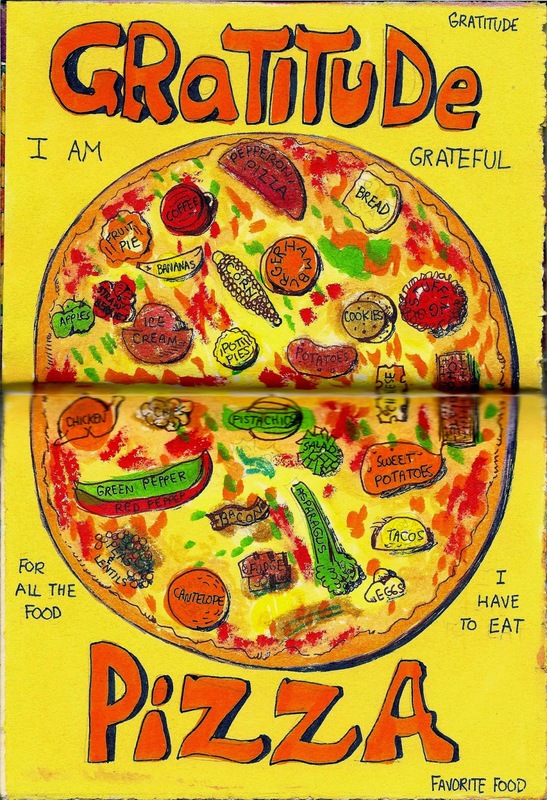 I used Kuretake Brushables, in Apricot, Pure Orange and Butter, to color the rest of the pizza. Brushables are waterproof markers with two tips. Both tips are the same color, but one is a 50% tint of the color in the other tip. 6. 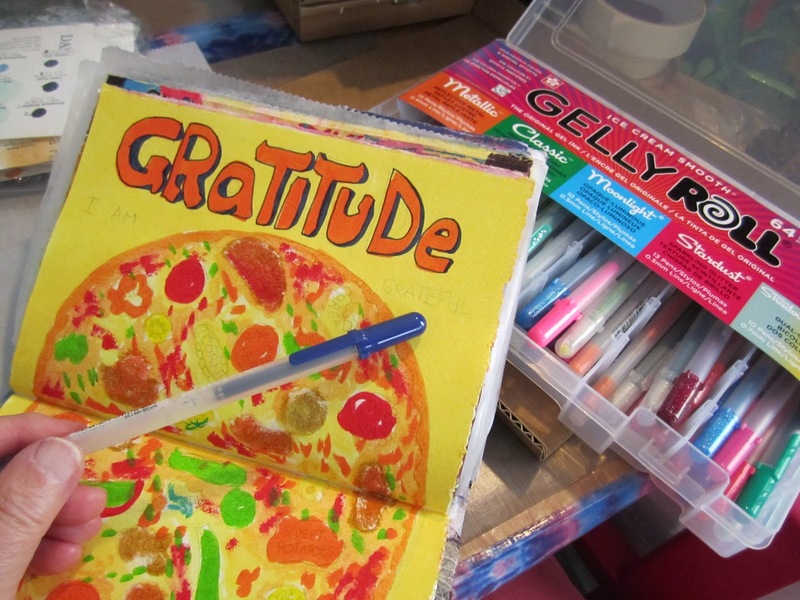 I finished up Classic Gelly Roll pens, outlining the large letters with Royal Blue, writing the words within the pizza with Black, and shadowing the food items with Burgundy. The whole thing took about 45 minutes, with the bulk of that time in the penciling in, and the outling with the Gelly Rolls.